Week 10 – How To Feel Peaceful And Calm In Five Minutes. All week long I’ve been listening to the Tapping World Summit and it’s allowed me to add new techniques to my teaching toolbox so I can use them in my workshops and retreats. I continue to be blown away by how effective this simple, self-administered process can be in treating everything from physical pain, to fears and phobias, and self-defeating habits. You can listen to the remainder of the summit until Friday by signing up here. 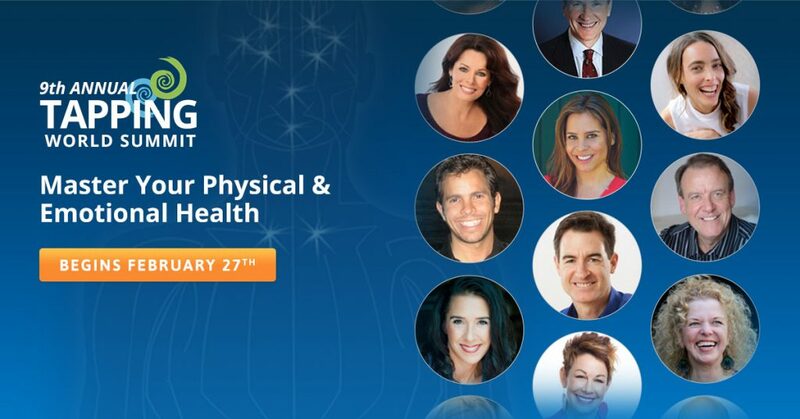 As I’ve tapped along with a variety of experts, I’m reminded of the powerful link between our emotions and the body. When we feel stressed or anxious, cortisol levels (the stress hormone) rise, inflammation ensues, and the hormones that heal and repair cells, like DHEA, decrease. This is why we must treat the emotional and energetic components of an illness in order to fully and completely heal. One afternoon last week, I listened to the summit presentation by Brad Yates and did the tapping technique to eliminate the stress of not being able to forgive someone for a past betrayal. Afterwards, I was amazed to not only feel love and compassion for the person, but I even had trouble accessing the memory. It was as if the tapping procedure shut the door to that experience. This week, I thought I’d share a simple technique to help lower your stress levels (who doesn’t have stress about something?). It’s one part of the tapping procedure and it can be remarkably helpful in reducing stress all by itself. Before you tap, think about something that’s causing you stress and measure the amount of anxiety you feel on a scale from 0 to 10, with 10 being the strongest amount. Then, you’re ready to start tapping. Even though I have this stress about (fill-in-the-blank), I completely love and accept myself. Even though I feel stressed and anxious about (fill-in-the-blank), I love and accept these feelings. Even though I can’t seem to relax about (fill-in-the-blank), I choose to feel peaceful and calm. Even though I’m afraid this stress about (fill-in-the-blank) will never go away, I choose to release it now. Keep tapping as you repeat these statements out loud three or four times. Then, close your eyes, take a slow, deep breath, and measure your stress level again on a scale from 0 to 10 and see if it’s decreased. Chances are it has. You can repeat this process as many times as necessary to get it down to zero. It has now been documented that tapping lowers cortisol levels by a significant percentage so it’s a great way to calm the fight-or-flight system and to help reduce inflammation in the body. Do yourself a favor and try this simple and unusual technique. If the responses on my Facebook Page were any indication of how well tapping works, I’d say you’re in for a pretty stress-free day . The Tapping World Summit continues here. During the summit presentation by Dr. Dawson Church, I got such a kick out of his laugh. It’s infectious and, I suspect, healing. It became so well liked by listeners that he put a recording of it on his website. You can listen to it, here. Thanks for sharing it with me, Nick!